The hukamnama today is by Bhagat Kabeer jee in Gonadd raag on Ang 872 of Siri Guru Granth Sahib Jee Maharaj. Gur peer sadae, mangan jaae ta ke mool na lageya paae. When guests come and they have nothing to share, how do they feel? Vaa kai - within that person, nehee santhokh - there comes no fulfilment, there is no satisfaction, there is no rest inside their mind. Imagine when one comes through the door and there isn't enough food to feed them, imagine how that person feels. Kabeerjee is telling us the truth. Guru Granth Sahibjee says there is such a wife when her husband is burning. Now which wife is that? Material wealth! Why? Because the $10, Rs 100,000 whatever which are in your pocket today, as soon as you die they do not burn with your body. Somebody looks in your pocket and says O look that person has got $10 in his pocket and that goes into someone else's pocket. That same $10 in his pocket goes into someone else's pocket and it carries on. But it is never without a master. Maya - material wealth is never without a master. If someone has been working all day hard, and they've been given a $100 - they look at that $100 with so much affection but if it falls out the $100 never says O you've been working for me all day, please pick me up. If it falls onto the ground someone else comes across that $100, picks it up and puts it in into their pocket. With hunger I cannot meditate. Dhhan means praise, all hail to Sohaagan - to this wife, to this bride, to material wealth. Why is Kabeerjee saying mehaa paveeth - she is the most pure? Now what does that mean? That means when money is spent by a Gursikh, when money is spent by a spiritual person that money goes to feed the hungry and homeless. When money is spent by spiritual person that money is used to connect people to God, that is why it is blessed. But on the other side Kabeerjee says, Thapae Thapeesar Ddolai Cheeth - thapae thapeesar - those people who have been sitting and meditating for many years, on one side a spiritual person uses money for the good of the world it is a blessing and on the other side material wealth can break the meditation of those who have been sitting in meditation for a long time. Ddolai means to waver, cheeth means consciousness, even those people who have been sitting for many years in meditation, material wealth has so much power it can even change them. So there are two sides to material wealth and that is the paradox, that is what we need to live with in this world. Guru Granth Sahibjee Maharaj is not telling us to run away from money, Guru Granth Sahibjee is not telling us to run away from the material world, Guru Granth Sahibjee Maharaj says live in the material world but just like a lotus flower lives inside the water but faces towards the sun, in the same way live inside the material world but keep your faith towards God. Rehaao - Kabeerjee says pause and think about this. Kirapan means the miser, poothee means daughter. Sohaagan in this case is used as material wealth. A miser looks after money like he looks after his children, or like she looks after her children. Now we may laugh if we hear this but it's true. Sohaagan kirpaa ki poothee - that person who is a miser sometimes we say he/she loves money more than he/she loves human beings, and its true! People who are misers look after money more than their own family and Kabeer Sahibjee is telling us that truth. Instead of going to servants of God jagath sio soothee - material wealth, this bride that Kabeerjee is talking about today, they are saying that she is sleeping with the world. But then what happens? The material wealth is ath sundharee - meaning the most beautiful. In her pag - in the feet she wears naevar - meaning anklets, the bells, in Punjabi we call them jhanjara - wherever she goes you can see, you can feel her presence. When someone with a lot of money walks into the room you can see from their clothes. It is as if you can hear the bells of money shaking, the bells of material wealth shaking. But Kabeerjee says don't look at her! Just see her beauty, just hear the sound of her anklets, no! For the amount of time you have your praan - you have your breath, thoo lag sangae - that amount of time she is with you. Chalathee Baar N Kashh Miliou Lee Langottee Thor ||144||Many many years you have spent getting those credit cards, getting that money, getting the bank accounts but when you are about to burn on the funeral pyre they say check his pockets, does he have his bank card in there? Does he have $10, $20, $30 in there, take it out, he won't need it now. As soon as you die it leaves you. That is the wealth of the world. Now Kabeerjee is saying that we need it to live in the world but don't look at it and give up that wealth which is going to go with you even when you die. Leeaa in this case means to conquer. The bride of material wealth has won all of the world, it has won all of the planets, everywhere! Even those people who are reading the eighteen puraans - dhas ath puraan - 10+8 = 18. 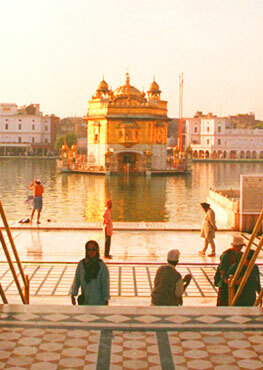 Theerath means the sites of pilgrimages. Those people sitting at the sites of pilgrimages and reading their holy scriptures even they are entangled in the ras, in the taste of material wealth. Kabeer Sahibjee says the demi Gods of brehamaa Bisanu and Shiva - they are all baedhhae - meaning they are all pierced through with the arrow of material wealth. If we read the stories of Brahmajee, vishnujee and Shivjee, we see that Brahmajee chased after his own daughter, Vishnujee chased after the daughter of jalandar daint - the demon jalandar, Shivjee chased after the mohni avatar. Now these forms of material wealth they have attacked even these demi Gods. Kabeer Sahibjee says those people, baddae bhoopath - bhoo means ground, path means master, those great landlords of the world, those great raajae - kings of the world they have been shhaedhhae - they've been cut through with the weapon of this material wealth. There is no ouravaar there is no paar - there are no limits to the power of material wealth. The clay pots of these five sensory organs have been mittavae - have been destroyed. Now what does that mean? Kabeerjee is saying that before I came to the protection of the Guru my sensory organs were entangled with maya, were entangled with material world but now I've met the Guru, my five sensory organs are devoted to the creator of the world. Kabeerjee says with the grace of the Guru I've been freed from the entanglements of maya, from the entanglements of the material world. Now this shabad has got a very deep meaning, the shabad is saying live in this world, work honestly, share your earning, but remember that the money within your pocket, your material wealth will not go with you. Whilst living in the material world, it is with you whilst you are alive, you need it, you need it to fund charities, you need it to feed yourself and your family, and those who come to your door but remember you need to feed your soul by falling at the feet of the Guru, Kabeerjee is saying today.